Susan Jane Napolitano was born on 28 October 1948 in London. Sue was a disabled lesbian, who worked from 1985-88 in the Equal Opportunities Unit at Manchester City Council. She was an accomplished writer, most well known for her radical poetry but also producing long and insightful articles. Sue was closely involved with the Greater Manchester Coalition of Disabled People (GMCDP) and in particular with its magazine, Coalition. In 1989 she was the editor of the Arts Focus section within the magazine, and she served on the magazine sub-group from 1992 to 1994. Sue also served on the GMCDP Executive Council from June 1992 to December 1993. Sue was ‘educated’ at Cloudesley Special School in Islington, London. Due to the poor expectations of disabled children’s potential, O level exams were not available at this school, so, thanks to her mother who was her fiercest advocate, she went to school during the day, and evening classes at night to gain enough educational qualifications to move on to studying for her A level exams – which she did at Highbury Hill High School for Girls. While at school, Sue told a careers adviser that she wanted to become a poet – quite different from the sewing machinist or pattern cutter job he had in mind. It took her another 20 years to achieve this aim. In 1967 Sue went to Birmingham University – “the only one that would have me that had accessible accommodation” she said – to study English. After this, she spent a year at Westhill College gaining a Youth and Community Work qualification, being awarded a scroll as ‘Most Vocal Student’ from her fellow students. In Birmingham, Sue became a community worker and then a disability welfare rights worker, was active in supporting the 1984-85 miners’ strike and sang in a folk group called The Red Hens. She produced a report “A Fair Deal for Fairways” which analysed the amount of unclaimed welfare benefits by disabled residents of a residential home. In 1985 Sue moved to Manchester to set up home with her partner and to join the newly-established Equal Opportunities Unit at Manchester City Council as one of three disabled people’s officers. The Unit heralded a new era of equal opportunities and Sue not only developed policies such as for Aids and Adaptations Grants for disabled people, but also benefited personally. She was immensely proud of project managing the adaptation of her own home in 1986, which included an internal lift – she had not had access to the upstairs of houses she had lived in since she had polio at the age of seven. Having a family home at last enabled her and her partner to plan a much-wanted baby. Sue turned her career towards the arts, taking a Community Arts course at Manchester Metropolitan University in 1988-89. Her placements included co-founding New Breed, the first disabled people’s theatre company outside London theatre and starring in their first production The Birds by Aristophanes. Sue subsequently thought of herself as a writer and started to develop her distinctive voice as a poet. She worked for a while for an arts charity, North West Shape, but had to leave when her post-polio condition worsened. From then on she was a full-time disabled poet, joining the circuit of disability cabaret performers. Having been awarded Attendance Allowance after several attempts she was able to employ her own personal assistants. Two qualifications for the job were: the ability to drive up to sixty miles to gigs, and to carry the armchair from which she performed. The undoubted highlight of Sue’s life was the birth of her son, Ben, which fuelled much writing: poems like To My Little Big Baby and articles such as Label: Prospective Parent where she tussled with the identity of a disabled lesbian non-biological mother. She also started a disabled women’s group at this time. Her large outdoor mobility vehicle – a bright red Trekka – was often seen with Ben riding on the back of it like a chariot, a technique they perfected when she graduated to a powered wheelchair. In 1991 Sue wrote a six-page article on the discrimination that disabled people faced in transport, The Mobility Jigsaw Puzzle. This included her call for “a powered wheelchair that is small enough to use indoors, butch enough to use outdoors”, a design that still escapes the so-called mobility experts. But a year earlier in 1990 she had published what was perhaps her most prescient poem on the sinister side of Jimmy Savile, the year he was knighted. It took the British mainstream institutions another 21 years to catch up with this criminally abusive and exploitative man. Lorraine Gradwell recalls a time when Sue was in a power wheelchair visiting an exhibition. It seems that the wheelchair had been loaned on a trial basis, and like a library book it was overdue its return. Someone from an official agency that had loaned the wheelchair had spotted Sue, and there ensued a chase around the exhibition with Sue ducking and diving. Naturally, she won. As well as writing, Sue also performed with readings of her poems, especially to radical disability arts events. These included readings at Liberty, Equality, Disability in York in 1990, at The Workhouse in London in 1991, and at the Derbyshire Disability Arts Forum in 1993. Reviews of her performances would sometimes note how nervous she would be beforehand, though discomfort may have played a part, and her later performances were given from her trademark large and comfortable armchair. For radical disabled people, perhaps her best known poems are Needing Disabled People (c.1980s), To Our Warriors (1989), No Flowers for Cathy (1992), and My Place. The latter has been widely quoted – including as the title of Living Where the Nights Jive by Maggie Hampton (Parthian, Cardigan, 2008). Her poem about Victorian architecture Disabled Apartheid featured in the exhibition showing the refurbishment plans for Manchester Museum. In October 1995, GMCDP published a collected works of Sue’s poetry as a small book and cassette, A Dangerous Woman, which is still in print. Sue died on 27 March 1996, aged 47 years. Her headstone quotes from the Holly Near song, It Could Have Been Me: “I’ll be a lover of life, a singer of songs, a farmer of food, and a righter of wrong” and her epitaph is simply that she “ran out of steam”. 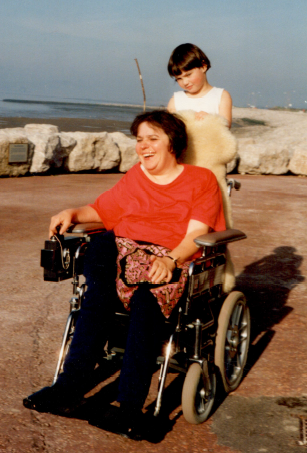 In July 1999, the Sue Napolitano Award for Disabled Writers was launched, offering £10,000 for a disabled writer to produce a body of writing which explores disability as its main theme. The same month a tribute to Sue was read by Bev Burkitt at an independence festival. Lois Keith won the award bursary to write her novel Out of Place, about a disabled child who fled the Nazi regime on the Kindertransport (Crocus, Manchester, 2003). Around this time the Sue Napolitano Social Club was established as an informal cultural group of politically radical disabled people interested in street protest, political art and radical events. In November 2010 a newspaper article in The Independent on the disability history month quoted Sue’s work approvingly with a quote from Disabled Apartheid (here). Sue’s poems appeared in Coalition, Disability Arts in London and other journals. She contributed chapters to Beyond Disability (ed. Gerald Hales, 1996, Open University, 1996) and Telling Our Own Stories (eds. Pippa Murray and Jill Penman, Parents with Attitude, Sheffield, 2000).